3D Printing Will Let Us Copy Any Object. Can We Stop It? 3D printing and additive manufacturing may be destined to change how we make and acquire objects forever. But it's also spurring a shadow revolution—one that focuses on how to stop us from replicating. 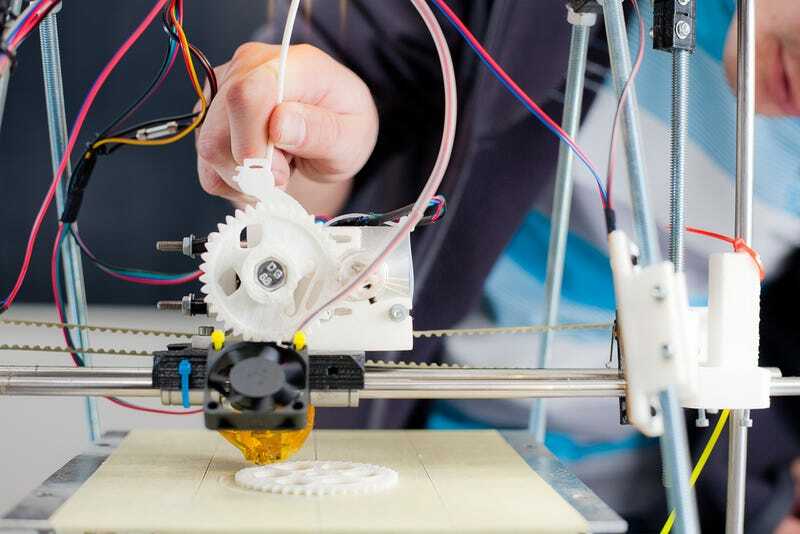 Concerns over intellectual property are as old as the idea of 3D printing itself. Here's how the nightmare goes: A consumer wants to buy your product—an iPod, let's say. But, thanks to the magic of 3D scanning and printing, they can just make their own version, using an iPod borrowed, scanned, and replicated from a friend. Then they can copy that again—and again—and now they're in the electronics business! So, spurred by concerns such as these, companies are struggling to come up with reliable ways to protect their products from replication. There are plenty of precedents. New Scientist points out the practice of record companies that embed copyright information into mp3s at a frequency too high for human ears to hear. Or the fact that most modern banknotes are printed with a pattern called the EURion constellation, which can shut down color copiers that detect it being scanned. In the U.S. twenty-dollar bill, this pattern is represented by the tiny yellow "20s:"
In theory, 3D objects could be protected the same way: By including a pattern or mark in a product's surface that's too small for human eyes to see, but which contains a command that will shut down the 3D scanner or printer being used to copy it. BLDGBLOG considers another alternative: embedding original products with "object cancers," that, when replicated, will produce mutations and alterations in the subsequent replicas—essentially, the plot of Multiplicity (1996). Today, Virginia Tech professor Thomas A. Campbell describes another idea in Scientific American: We could design original objects with specially-formed nanomaterials that trigger specific shut-down commands when someone attempts to replicate them. So, theoretically, that Birkin Bag you're trying to copy could be "watermarked" with a unique material that's only detectable at certain wavelengths—or a type of fluorescence that human eyeballs can't see. Of course, scanning and printing technology is nowhere near sophisticated to achieve this yet—but the fears over IP infringement are nonetheless growing. Campbell wraps up by explaining that it's the U.S.'s outdated IP laws that need to change, not the technology used to protect against copy-cats.